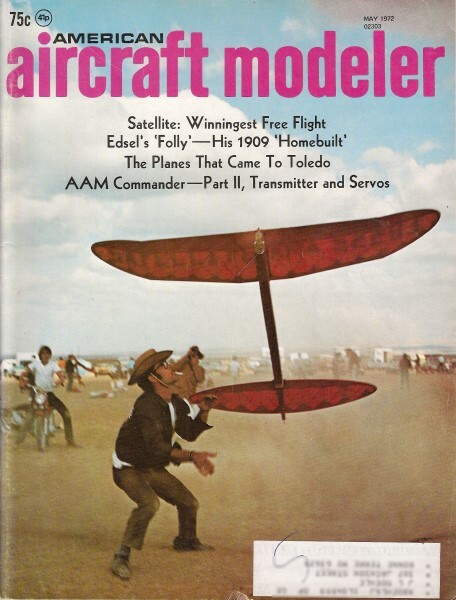 While looking through some old issues of American Aircraft Modeler, I was quite surprised to find that none other than radio great Paul Harvey is (or was) a builder and flyer of radio controlled airplanes. 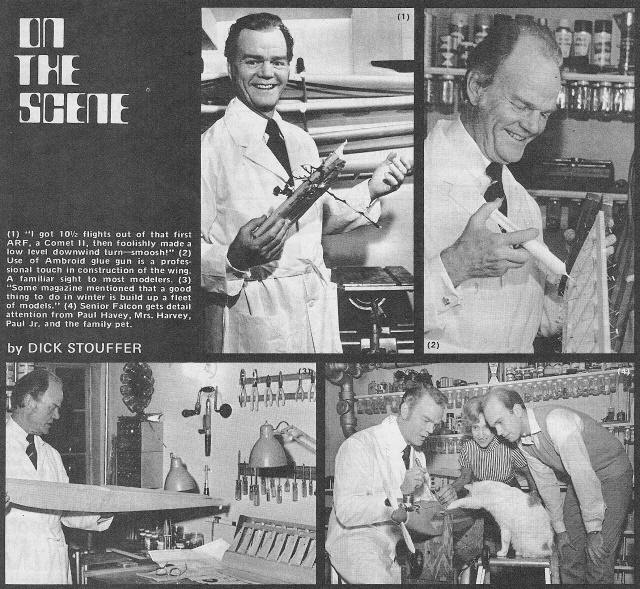 The first feature on Paul Harvey appeared in the May 1972 edition in a monthly column titled, "On the Scene." (see below) Mr. Harvey then wrote a regular column titled "Paul Harvey Views." Note the brace and bit drill and the "egg beater" drill beneath it. Those, along with the parts bins made of baby food jars really betrays the era. "Paul Harvey News" comprises the largest one-man news network in the world. Paul Harvey prepares and presents daily broadcasts over 500 radio stations in 50 states, the Armed Forces Radio Network overseas, 126 television stations, a column for 300 newspapers and he speaks personally to audiences aggregating 1,000,000 persons annually. In his spare time he authors books, records albums, operates a cattle ranch and is husband to his manager and number one fan, Lynne ("Angel") and father to young Paul, Jr., a budding and talented concert pianist. model builders. He "told it like it is" to this reporter over the sound of sandpaper shaping balsa in his well-organized home workshop. "I soloed when I was too young to be licensed in a rebuilt Monocoupe. That was a hundred years ago in Tulsa, Oklahoma. This may interest you, Skipper, more as a flier than as a modeler. I've thought so often how distorted our perspectives can get. A friend and I bought an old rebuilt Monocoupe, and an old motorcycle with which to get back and forth to the airport in Tulsa. "My life was so wrapped up in that plane that the one time I should have jumped because there was no possible place to sit down outside of some trees, I didn't. All that was going through that young brain of mine was 'If anything happens to this airplane, I don't want to go on living anyway: So I went ahead and landed it in the trees. "Isn't it strange how values change? At sixteen I wanted to go down with my plane-I figured if I couldn't salvage that beautiful bird, what's left? Isn't that terrible? I've tried to tell young Paul to be very careful that youth does not distort his perspectives. "I don't know how many total hours I've logged. Thousands. Nowadays I just keep the license active. I lease a 411, have a full-time young pilot, Captain Jerry Foster. He keeps current and is an excellent instrument man. I crawl in the back and relax. Often after a distant speaking engagement the only sleep I get is aboard. So I crawl in the back and sleep or study. Flying has become so regimented it isn't fun anymore. I didn't check out in jets. I flew Bill Lear's on one trip-real rocketry. But this is fun! RC modeling is an exciting challenge! It is like golf-there's no way to get good enough; no possibility of perfection! I. can't wait to finish this one because I've learned so many things that'll make the next one better. Just like that frightful, frustrating, imperfectable game of golf! "When my son was much younger we fooled around with UC for a season out in the back yard. That was many years ago. Those days the early radio stuff was so complicated, unreliable, and inadequate that we never did go into radio. "But one Sunday after church Angel and I were driving past the Meadow (Miller Meadow, a recreational park in Chicago), heard this racket, and went over to watch what the fellows were doing with those fantastic, refined, sophisticated, precision performers. Then and there the model plane bug bit again. I could hardly wait to get the first kit. "You know Skipper, I can't think of any other sport-hobby in which the veteran participants are so eager to help beginners. I've seen this mentioned in your magazines, so I know this is nothing I discovered. But I keep thinking-if the fellows had been less friendly that first day we stopped by Miller Meadow, if they had seemed a stuffy sort that didn't want anybody else to share their know-how, learn their skill (the sort of atmosphere you sometimes find around a machine shop or around . some professions)-I wonder how much different it might have been? Instead, the first fellow I saw wanted me to fly his airplane! With no experience at all! They can't wait to share the fun, share innovations. Sharing is the reason we don't usually go out there alone, isn't it? "And there's another thing which I understand IS not unusual, but it's mighty impressive to me. There's this chap named Dave at AI's Hobby Shop in Elmhurst. There have been days when I have been on that phone with him six times, even during the pre-Christmas rush. I try to make my questions brief knowing how busy he is, but I've been in here trying to find my way through a kit and not even knowing the names of the different parts, and I'd quick-call Dave. He's never once been the least impatient. "I got 10½ flights out of that first ARF, a Comet II, then foolishly made a low level downwind turn-shmoosh! I went from that to these Dubro's that I completed this winter and which I've not yet had a chance to fly-one high wing, one low wing. Some magazine mentioned that a good thing to do in the winter is build up a fleet of models. After losing one and having nothing to fly, including some of my servos being damaged, I wrote a letter to Santa Claus and "she" brought me a second ProLine. Santa Claus also brought this new RCM Trainer kit, the first thing that I've started from scratch. "I already have the "Big 88" kit coming from Amarillo so Paul and I will be ready for Spring! I know it's pretty bold with no more experience than I have, but I thought I'd at least try to put flaps and running lights on the big 88-incher and make some other modifications of my own. It's got to be exciting! "I don't know how long my intensity of interest in this hobby will sustain. There's no way of knowing. But right now my office has instructions to put telephone calls to and from the hobby shop on the priority list. "My first intention was to start small-single-channel-but club members at Miller Meadow counseled against it, saying they knew I wouldn't be happy with proportional very long. So I got the multi-channel and have been very glad I did. Now with the second set and the buddy cord, young Paul and I can share the test flights. "A friend test-hopped our first Comet-Bill Kadlec, an excellent flier and patient teacher. He and Ben Miller did all takeoffs and landings for me at the beginning. I was absolutely stunned to learn that somebody with as many big plane hours as I, was such a lousy little plane pilot. I just couldn't believe to what ridiculous extent I was over-controlling that thing. There I'd been, cruising comfortably at jet speeds, and this little thing at ninety mph had me trembling. It's learning all over again. I don't see that being a pilot is any advantage whatever. Certainly not so far as technique is concerned. "More than any sport, modeling is wonderful therapy. Even to slip down here to the workshop for an hour in an evening is immensely relaxing. It takes you far away from the ugly headlines. Mostly mud and blood make news. So it's nice to have this refreshing diversion that requires your total concentration. "My workday begins at 4:30 a.m., when I start preparing the first broadcast. After that's done, I start preparing the second broadcast. After that I write the newspaper column and the daily television commentary. "I love work. Many days I start at 4:30 a.m. and do all of my broadcasts, telecasts and newspaper columns, fly to New Orleans and make a speech and get back in here at 3 :30 a.m., take a shower, shave, and go right to work again. But my vocation and avocation have been the same thing. I love to work so much I'd do it for nothing if I had to. Even idle hours I want to employ constructively and this to me is that. "So those days when I'm not filling a speaking engagement somewhere, I come home early afternoons and play airplane designer. "Yes, I've mentioned this hobby publicly-with pride. Anything that accentuates the positive, anything that bridges the so-called generation gap, anything that preoccupies young people with something useful and constructive, should be held up as a worthy example. I think we newsmen should accentuate the positive more than we do. Too consistently the only young people we report in the news anymore are the troublemakers, the screwballs, and the ones with this tantrum syndrome who lie down in the streets and kick up their heels and demand, and demand, and demand, and demand. Isn't it wonderful that we have outlets like this that are attracting more and more people everyday? "I'm regretful only that the costs involved preclude sophisticated modeling for some young folks. But, maybe some of us can help out there, too. "I gave one of our old CL models to the 'Y.' I don't think those things ought to hang around in workshops when they're not being used-not since there are YMCA's, Boy Scouts and the Salvation Army and other organizations that can put them into the hands of a youngster who can't afford them. Maybe more of us ought to do more of that!" "Paul Harvey .... Good day'"